The 10/40 window between 10 and 40 degrees north of the equator where most unreached peoples live. Watch a U tube slide presentation of the current state of world mission. Before Christ returns for His bride all the elect must be gathered from every tribe and ethnic group (nation). This is far from complete. There is one major reason for the writing of this article. The return of Christ and the end of this age depend on the fulfilment of the ‘Great Commission.’ Christ stated in Matthew 24:14, that before His public return on the clouds, the gospel had to be preached to all nations . We know from later verses in that gospel, namely chapter 28:18-20 that the church is commanded to make disciples of all nations and that means well taught followers of Christ from every ethnic group. All the elect for whom He died MUST be gathered. The Great Commission must be central in the work of every Reformed denomination, church and individual believer. It is the central purpose of earth’s history. The Reformed worldview must include God’s purposes in the world to call out a glorious catholic church among every people. Paul’s ambition, as recorded in Romans 15:20 was to preach the gospel where Christ had not been named! That should be the collective aim of Reformed churches. ‘ Despite the claims of some, Calvin insisted that the church has an abiding call to bring the gospel to the nations. In his extant congregational prayers, one can hear Calvin praying for the gospel to go out to those who are lost. One of the key things to recognize about Calvin’s theology of mission is that he sees the objects of mission in broader terms than many would today. This was true of all sixteenth- and seventeenth-century Reformed believers. For Calvin, Europe under the sway of Roman Catholicism was essentially pagan, or at least sub-Christian. From his standpoint, the lost were certainly in far-off lands overseas. However, they were also close to home, wherever people still consistently held to Roman Catholic beliefs and practices. This led Fred Klooster to comment some years ago that the Reformation “deserves to be called one of the greatest home missionary projects in all history.” The comment is anachronistic insofar as the Reformers themselves made no distinction between local evangelism and foreign mission. Calvin and other Reformers saw all gospel outreach as mission, whether local or otherwise, whether within a culture or cross-cultural. The Reformed faith should emphasise knowledge of the Word and knowledge of the world! By ‘world’ I mean the world of mankind in all it’s diversity of ethnic groups, lost and totally depraved. All men are descended from Adam and Noah, of every colour and language since Babel spread them over the earth. It is reckoned by ethnologists that there are about 10,000 people groups in the world today, who like the Kurds may cross political boundaries but nevertheless are a homogenous group. It is important to emphasize that ‘nation’ in scripture in Greek is ‘ta ethne’ from which we get the word ‘ethnic’ and does not mean a political nation but a people group. These groups would be people of the same tribe, have similar customs, language and dress. The actual people may live in one political nation or be spread over several and with today’s global transportation may have moved many thousands of miles away from their homeland. For example, one of the largest peoples without political nationhood are the Kurds who live in Eastern Turkey, Northern Iran and Iraq; they are actually descended from the ancient Medes of whom one was Darius who overran Babylon in the days of Belteshazzar. There are Kurds now in Western Europe and the USA. How many of these peoples have few, if any, believers among them? Approximately 4,000. They all have less than 2% professing Christians but many as few as 0.01% ie 1 in 10,000 and some even none at all. One basic essential to effective church planting is an accurate translation of the scriptures in the language of the people being reached, but with many of these groups there may even be no written language, or if there is, few can read it. Pioneers are needed to produce the scriptures first in audio and then in written form. Of the world’s more than 6,000 languages only 700 have a Bible, 1,400 a New Testament and 2,000 portions. It is estimated that another 2,000 languages may need Bible translation. We believe that missionaries are trained, ordained men who are called and sent. We also believe there is a place for lay people moving to the field to support these pastor-teachers. We must also agree that there is a place for ‘tentmakers’ namely called trained men like Paul who must work to support themselves till a church or churches can support them. In many countries having a job or practical missionary skill is a prerequisite for entry to the country. There are many ‘missionaries’ and laymen today, who are wrongly doing the work of teaching and who often are teaching a false gospel. There are many women doing the work that is Biblically only for men. The numbers of Western Missionaries is static at about 40,000 today but many more are being sent out by ‘third-world’ countries where the church is also now established and appears to be growing fastest eg South Korea, China, Brazil, and the Philippines. Most of these however minister in places where there are already established churches-very few are church planting in totally heathen lands. This was actually Paul’s ambition in Romans 15:20 as already mentioned! Our Lord clearly stated that the harvest was plentiful but the labourers few. Mission depends on financial support of the missionary and his family. Of the finances given for mission work, less than 1% is spent on reaching totally unreached people groups. Where are these groups? In the ‘10-40 window’, which is an elongated rectangle which encompasses land between 10 and 40 degrees north of the equator stretching from West Africa to Indonesia. It includes India with 1.2 billion folk which has the most, perhaps 1400 unreached peoples. Many live in remote areas, are nomadic, illiterate and poor and huge barriers will have to be surmounted to reach them. I know of a friend in Southwest China who is seeking, along with local Chinese believers, to reach various totally heathen, Buddhist Tibetan groups who have never seen a ‘white man’ far less a missionary in their whole history. There are other barriers to reach these peoples -some live in lands where the people are almost 100% Muslim, eg Saudi Arabia and Afghanistan or under political powers like communism eg North Korea where Christianity is outlawed on pain of death. 1. The majority of the least reached are last to hear the gospel because they are remote and isolated geographically, linguistically, politically, religiously, socially and spiritually. They will need cross-cultural workers called of God. 2. Few of the over 6,000 least reached peoples have no known Christians but generally they constitute a tiny minority ie 4 in a 1,000 and many of these groups are sizeable eg Northern Uzbek 22million! 3. Many of these groups are very small in size (under 10,000). 4. Churches worldwide need to gain a world vision-God’s plan is for the ETHNE people groups. 5. There must be disciples made from every people on earth indeed every kindred (clan) (Rev.7:9). What should the response of Reformed churches worldwide be to these statistics? Firstly we must pray-ALL can do this. Pray for ordained labourers and supporting lay people to be trained to go to the unreached in their own countries and overseas across cultures. Pray for the peoples themselves using tools like the ‘Joshua Project’ on line or the book ‘Operation world’-that God would prepare hearts and open them to the saving message. We need to pray for increased literacy among many groups and the translation of the Scriptures into many more languages. (see Wycliffe Bible Translators). Mission concern should be an integral part of every church’s life and their prayers and notice boards should reflect this. Someone famously stated that he could not understand why the gospel should be heard repeatedly in certain places while others had never heard it once! This make sense –we live in post Christian nations where anyone can access the gospel on line or find a true church somewhere-whereas folk in Afghanistan or Tibet cannot. It is a sad but startling fact that over 80% of the people in the Indian subcontinent will not know a true believer! Mission is the responsibility of the local church not parachurch organisations.The Chinese church is responsible to reach the unreached in China as the Indonesian church is for Indonesia, ditto for India etc. Here’s a worthwhile quote. This is how to respond to the ‘Macedonian call’…’Come over and help us.’ Acts 16:9. ‘I look upon foreign missionaries as the scaffolding around a rising building. The sooner it can be dispensed with, the better; or rather, the sooner it can be transferred to other places, to serve the same temporary use, the better.’ Hudson taylor. In other words the missionary or church planter’s aim is to make himself dispensible. Still the church worldwide can play it’s part. Georgetown PRC has input into the life and ministry of Rev. Paulraj in Vellore and support for his church and orphanage. Hope PRC are supporters of work in Myanmar with Rev.Titus. 1.Study theology—the better we know God, the more likely we are to fulfil His purposes. 2. As individuals and churches, support in prayer and financially the missionaries we have sent out from our established churches and denomination, and others God has bonded us with. 3. 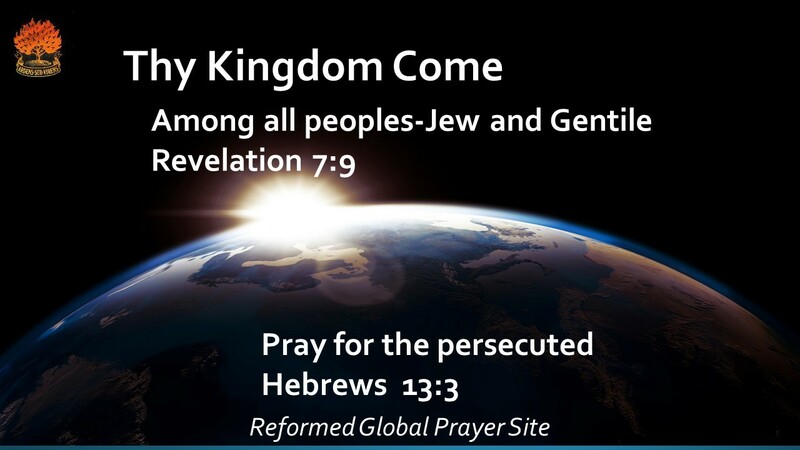 As individuals, in house groups and churches, assemble information and pray for un-reached peoples of the world. 4. Be prepared to go, if qualified and called. 5. Pastors and elders teach the centrality of world mission from the pulpit and in visitation. 6. Teach world missions, missiology, culture, and linguistics in our seminary. Churches like ours can ‘Adopt-a-people’ and spread information about them to the congregation, who can in turn pray for and perhaps even visit them and if the Lord will, send missionaries. Sometimes God brings the unreached to us-they come as students from Saudi Arabia or Somalia or emigrate and may be glad of the freedoms we have and when exposed may be responsive to the gospel. What part would God have you play in bringing to pass that prayer-‘Thy Kingdom come’? Amen-Amein and Thanks so very much Sister and Brothers in Christ-Messiah Jesus-Yeshua!! ❤ GOD Bless You and Your Family and Friends! !